Obituary for Vito A. Ottaviano | Magner Funeral Home, Inc.
Vito A. Ottaviano, 94, of Norwalk died on September 7, 2018 at Notre Dame Health & Rehabilitation Center. Born in Stamford, the son of the late Theodore and Concetta (Catino) Ottaviano, he was the beloved husband of the late Virginia (Rubino) Ottaviano. 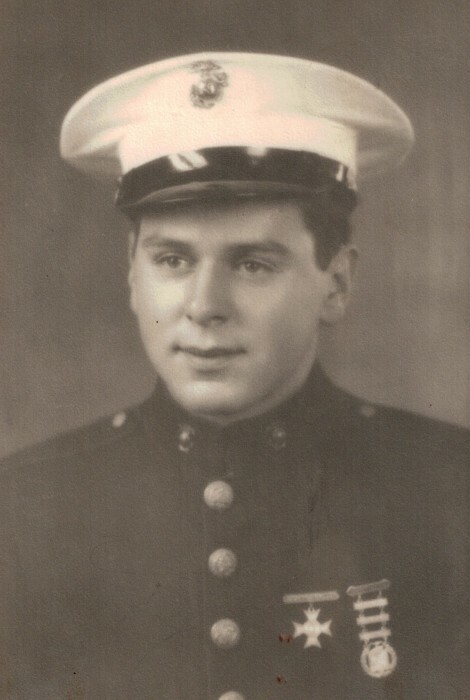 A veteran of World War II, Vito had served overseas in the U.S. Marine Corps. He retired as a salesman for the Marle Co, after 35 years of dedicated service. He was also a member of the USMC League, Knights of Columbus and was a former golf commissioner in Stamford. But, he will best be remembered for his dedication to his country and his love for his family. He is survived by his daughters, Sandra Roberto and her late husband Robert of Norwalk and Maria Vincent and her husband Curtis of Norwalk, as well as loving grandchildren; Kim, Alison, Michael, Emily and Leah and cherished great-grandchildren; Eric, Kyle, Ashley, Mikenna, Emma, Mya, Jack and Violet. He is also survived by his brother, Theodore Ottaviano. His family will receive friends on Monday, Sept 10 from 4-8 PM at the Magner Funeral Home, 12 Mott Avenue, Norwalk. A Mass of Christian Burial will be celebrated at 10AM on Tuesday, Sept 11 at St. Bridget of Ireland Roman Catholic Church, 278 Strawberry Hill Ave, Stamford. Burial with military honors will follow at St. John Cemetery, Darien. In lieu of flowers, memorial donations may be made to: (make checks to “SSTV- Capital Improvements”) Notre Dame Health & Rehabilitation Center, 76 West Rocks Rd, Norwalk, CT 06851.